As a part Chennai beautification drive, the Chennai Corporation has made initiatives through the students of Government College of Arts and Crafts, Egmore, Chennai and they have designed four thematic sculptures. 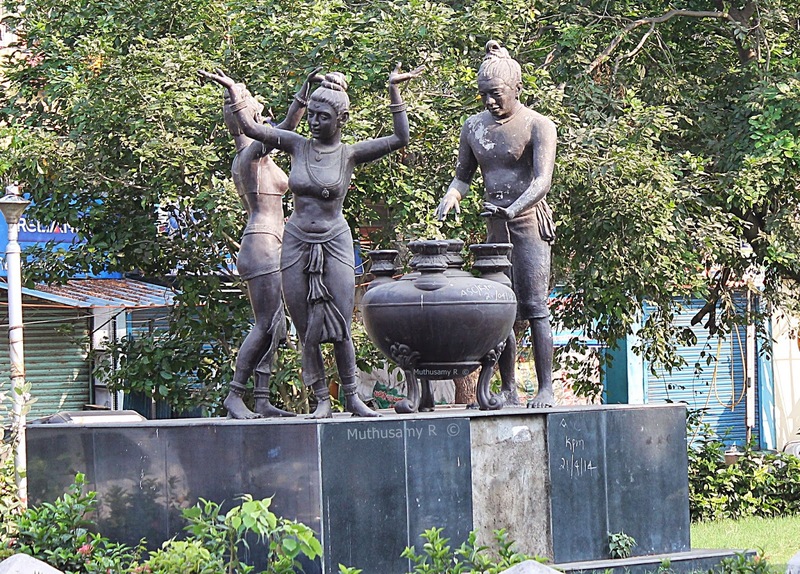 These four thematic statues were erected at four different vantage points of the city. Theme: Bull and elephant, the symbol of Sangam age: Venue: Near Light House, Marina beach, Chennai. Theme: statue of a boat: Venue: Installed inside the Dr. Annie Besant Park at Ice House which faces the Marina Beach, Chennai. 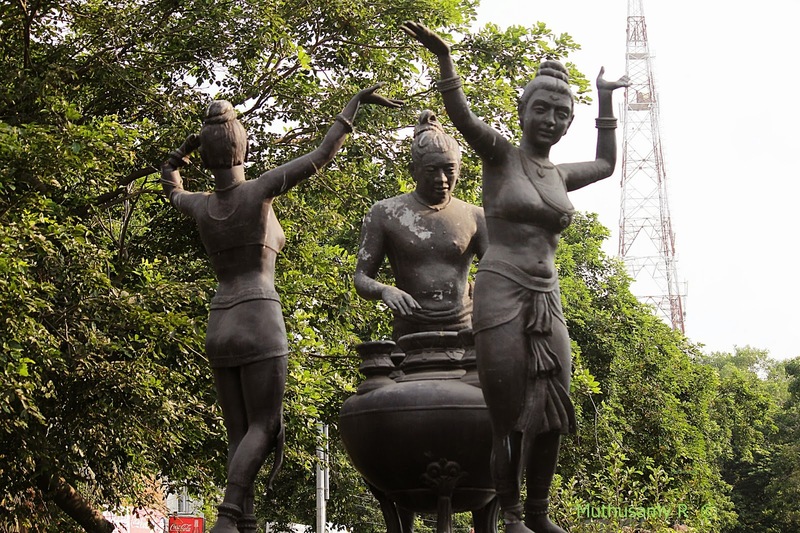 Theme: Music troupe: Venue: Erected at the intersections at Ramakrishna Mutt Road-Broadies Castle Road and Kamarajar Salai-Link Road (near to corporation play ground and opposite to Government Music College Adyar), Chennai. This post is about the 'Music Troupe,' the fourth theme. 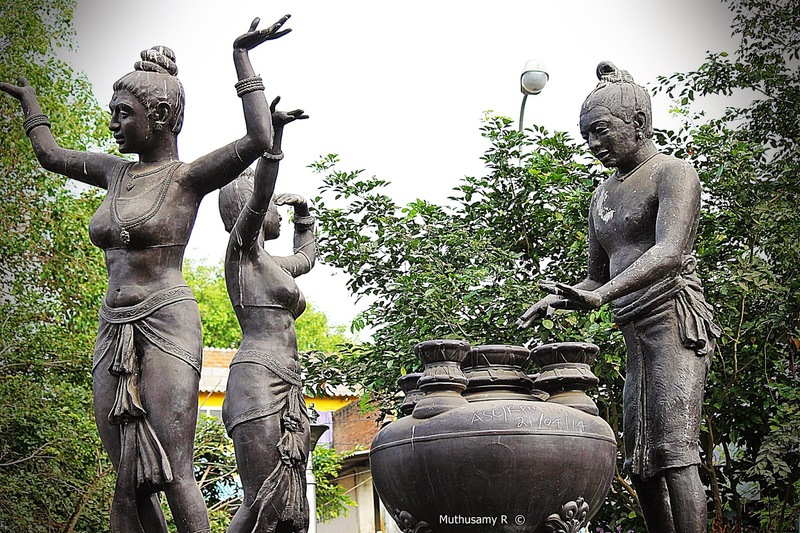 The thematic sculpture is depicting the music troupe comprising two danseuses and the male drum beater. The statue of two danseuses exhibit graceful facial expressions with their emotive eyes, hands elaborating 'mudras' (gestural expressions by the hand palm and fingers) and the legs showing fine adavus with firm footwork. The hair style, ornaments and the costume of the danseuses were sculpted with punctilious care. 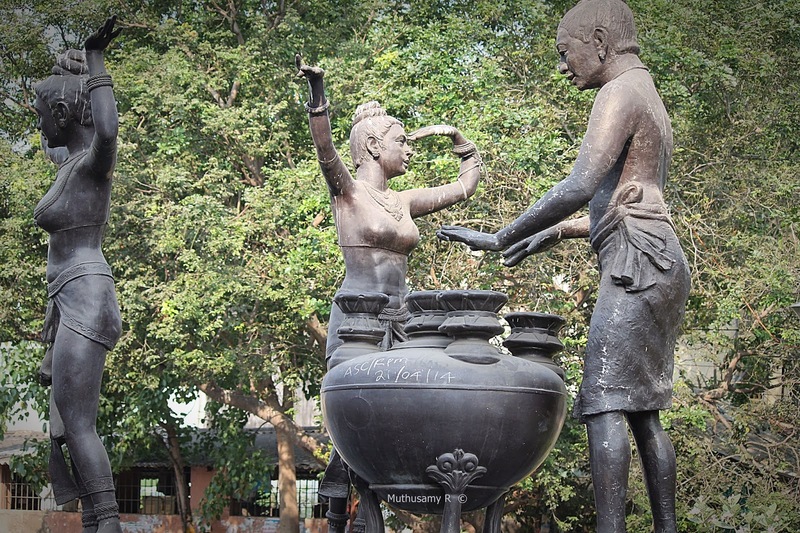 The drummer use both of his hands to beat the panchamuga vadhyam, a drum (the percussion instrument) with metal base (copper or brass metal) and with five faces (mukha), named after the faces of Lord Siva: Sadyojatam, Isanam, Tatpurusham, Aghoram and Vamadevam. 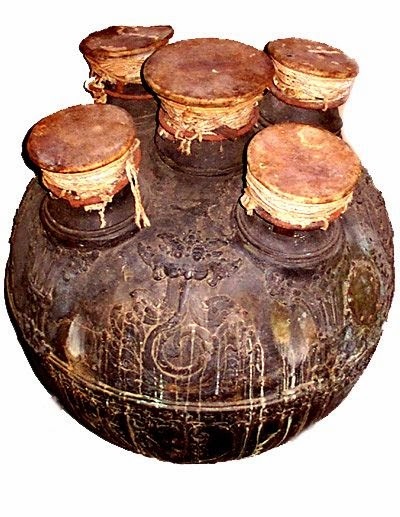 It is learned that this instrument originated in 12th century during Chola rule and the ancient instrument is also called in Tamil as 'Kudamuzha', 'Kudapanchamuki.' 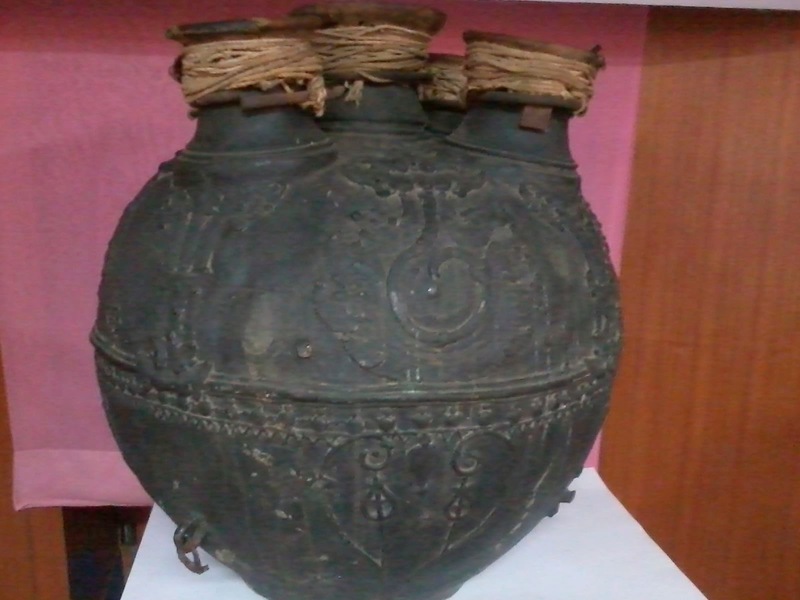 Please note that the central face of the drum shows larger diameter than the other four peripheral faces. Each face produce its own unique sound and five different sound produced are musically related. The rare musical instrument is in use in prominent temples like Thiruvarur and Thiruthuraipoondi temples. I presume that the instrument at Thiruvarur temple is used in this 'Music Troupe' as model. The well trained drummer, with adequate skill and knowledge in music was employed as temple staff and he was playing it during pooja timings and during processions. In the World Tamil Conference 2010 Coimbatore Semmozhi Manadu there was a display of Panchmukavadhya and it was weighing about 1 1/2 ton.